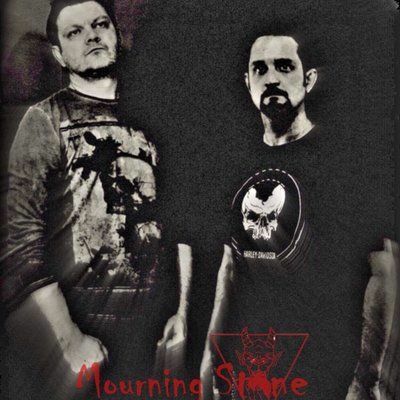 Alternative Rock band Mourning Stone is the collaborative project of Adam Maxfield (Vocals, Bass Guitar and Programming) of London England, United Kingdom, and Wes Dinwiddie (Guitars, Synths, Vocals, and Engineering) of Houston, Texas. Adam and Wes have been developing the sound and vibe of the band since January 2015. Mourning Stone powers through with guitar-driven hard rock anthems while winning the hearts of their listeners with their rich, warm tone and liquid melodies. Mourning Stone's debut EP, "Five Ways to Broken", released December 19, 2015 parades their heavy, down-tuned Alternative Hard Rock side and gracefully displays the much softer and tender face of the genre. Their lyrical style is simple but passionate, and easily relatable to everyday experiences. In March 2016, Mourning Stone was selected by A.V.A. Live Radio as a featured artist for their song “Think Twice”, and was subsequently published online with American Pride Magazine. Mourning Stone continues to harness the airwaves on a regular basis with Independent Share Radio, The Pat Stone Show, as well as featured segments in podcasts and blogs all over the world. Wes has collaborated with producers and publishers for T.V. and film placements, and has worked specifically on projects where heavy rock guitars were a requirement. In 2014, Wes licensed his first track with co-writer Shawn Tallard to CMT’s program, FNA USA. In 2005, he gained attention from winning a guitar contest at Camp Pendleton, CA. This earned him a spot to play on stage with Godsmack at a special charity event to support the troops who were returning home from combat in the Middle East. “qy67aZw’ the Corps” was filmed and played live in front of a crowd of 40,000 people, and was also broadcast live around the world by the Armed Forces Network.